Natasha Desborough – a former presenter on BBC Radio 6 Music and Xfm – is the author of the recently-released Weirdos vs Quimboids, a laugh out loud book for teens. Join Blossom as she navigates the politics of school life and see if working on the school radio station will be her route from weirdo to ‘cool kid’. We caught up with Natasha to find out more about her own schooldays and why she related to SE Hinton’s The Outsiders. Looking back to your own schooldays, which character do you empathise with more; Blossom who’s on the outside ‘looking in’ or the uber-cool Fiona? I definitely empathise more with Blossom. When I was at school I was a bit of an outsider. I didn’t dress like the in-crowd – I felt different to them. I wasn’t brainy or sporty so I tried to make people laugh so that I’d fit in. Luckily my best friend was a gorgeous looking, lovely, popular girl who always got invited to the cool parties so I’d tag along with her. None of the cool boys wanted to snog me though. What advice would you give Blossom if you were her best friend? I’d constantly tell her that she was a lot prettier than she thinks she is. She really doesn’t think she’s a looker. How would you sum up your teenage self in three words? School life can seem very cruel at times. Do you have any stand-out memories of your own time at school? When I was 14 I went with my best friend to one of the coolest parties ever. There was an outdoor swimming pool (which I didn’t go near – there was no way I was going to wear a swimsuit) and loads of alcohol. I couldn’t believe my luck when a I ended up snogging a really handsome boy who I’d fancied for ages, at the end of the garden. Afterwards he asked me out on a date but I got all nervous and started laughing hysterically. He stood up and walked off in a mood. Within a week he was going out with another girl in my year. I was so upset. It was the first time my heart had been broken. Which character in Weirdos vs Quimboids did you find the easiest to create? All of the characters were easy to create – they evolved organically with hardly any effort. But I’d say that Matthew Ludlow was the most fun though. I think if I’m honest, although Blossom was probably who I wanted to be when I was a teenager, Matthew he’s probably the closet to who I really was. He’s very misunderstood! Is there a children’s book which really resonated with you when you were growing up? A book that you felt was talking just to you? When I discovered SE Hinton’s The Outsiders, I knew it was special to me. A coming of age story, charting the intense friendships between angry, troubled teenagers which made total sense to me. Ponyboy and the greasers sort of made me feel normal. Is there a character from children’s fiction which reminds you of yourself or alternatively, a character you’d aspire to be like? I absolutely adored Laura Ingalls from the Little House On The Prairie series. She was a tomboy like I was and I loved that she preferred to fish and climb trees rather than do chores with her boring sister Mary. I remember being engrossed in the second book on a long drive down to Cornwall with my family for our summer holiday. I was at the bit where the whole Ingalls family catch an awful fever and Laura becomes delirious. I’m not entirely sure if it was an action of sympathy or if it was the two packets of Love Hearts that I’d just snaffled up but right at that moment, I threw up all over my book. The damage was bad and we had to throw the book away. I cried for the rest of the journey not knowing if Laura died or survived. Can you tell us if you’re working on a new book at the moment? Are there any little snippets you can share about it? 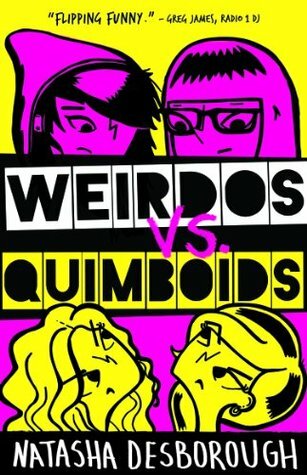 I am working on the follow up to Weirdos vs Quimboids. It’s shaping up to be even funnier. We find out a lot more about Matthew Ludlow and Blossom gets a new love interest. And that’s all I’m saying for now. To read more about Natasha, visit www.natashadesborough.co.uk. You can also find Natasha on Facebook and follow her on Twitter @TashDesborough. Natasha is represented by Sophie Gorell-Barnes at MBA Literary and Script Agents.